There is a single wear bush in SB hammers and two wear bushes (known as upper and lower) in larger EC, MB and HB hammers. Correctly used and greased, hammer wear bushes can last a very long time. 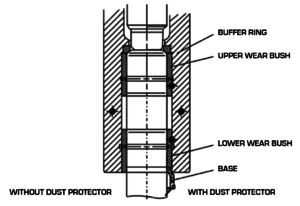 There are two key factors that affect hammer bush wear – loading and lubrication. sometimes as little as a shift in very hard conditions. can also create failure of the tool. irreversibly damaging the front head mechanism and pistonwhich is costly to replace. expected, with changing only needed during general service intervals.